EHL Group design, install and maintain a range of compressed air, air treatment, gas generation, and liquification systems and all peripheral componentry to meet the most demanding application. Ensuring the correct technology is employed to ensure maximum efficiency covering both production and energy use is the key to meeting the exacting demands of all applications. 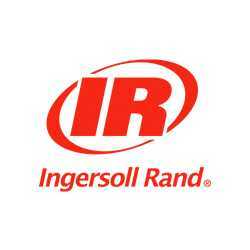 EHL Group use and recommend world leading compressor manufacturers like Ingersoll Rand, Sullair, Hitachi, and Rix to enable the provision of the correct compression technology to most effectively and efficiently meet the demands of any application. 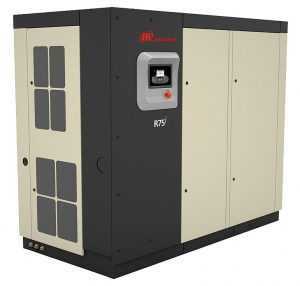 Reciprocating (Piston) compressors are a basic compressor which compresses air through the piston inside the cylinder. 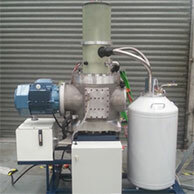 This compressor design structure is simple and easy to maintain. Suitable for manufacturing industries, automotive service workshops, spray painting and pneumatic tools. 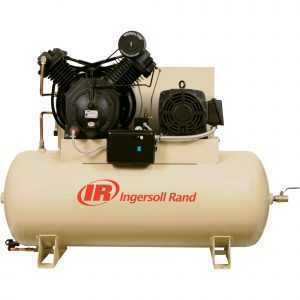 A reciprocating compressor or piston compressor is a positive-displacement compressor that uses pistons driven by a crankshaft to deliver gases at high pressure. The intake gas enters the suction manifold, then flows into the compression cylinder where it gets compressed by a piston driven in a reciprocating motion via a crankshaft, and is then discharged. 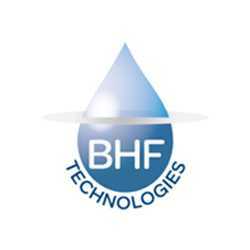 Applications include oil refineries, gas pipelines, chemical plants, natural gas processing plants and refrigeration plants. 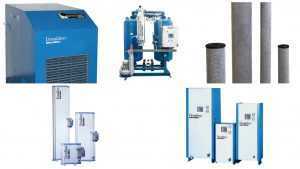 One specialty application is the blowing of plastic bottles made of polyethylene terephthalate (PET). 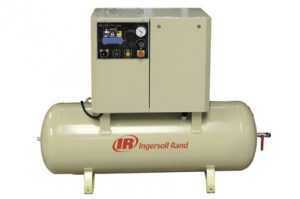 Scroll compressors are a compressor which compresses air to gyrate two scroll-like heads. This design reduces the pulsing motion and vibration during operation, resulting in low noise and low vibration. The design offers more space saving solutions and the multi-drive control also improves on energy saving. Suitable for R&D laboratories, schools and specialised industries. Depending on the air requirement, the PC board controls the running of the number of scroll heads. This function not only saves energy but also optimises the operation by keeping to the required pressure. Control Mode setting can be changed between Multi-Drive Control and Pressure Switch Control. Under Multi-Drive Control mode, the operation of SRL heads is modified automatically, responding to the need of air. 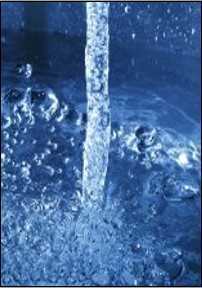 The necessary pressure is maintained producing an optimized, energy-saving performance. 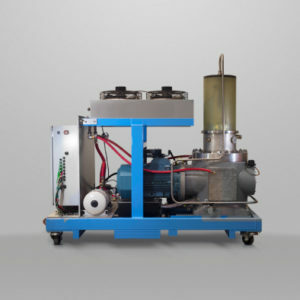 In an oil-injected rotary-screw compressor, oil is injected into the compression cavities to aid sealing and provide cooling sink for the gas charge. 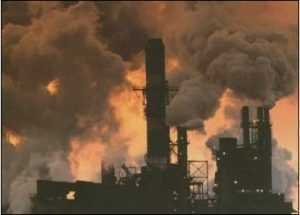 The oil is separated from the discharge stream, then cooled, filtered and recycled. 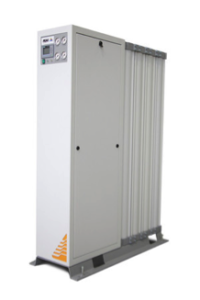 The oil captures non-polar particulates from the incoming air, effectively reducing the particle loading of compressed-air particulate filtration. 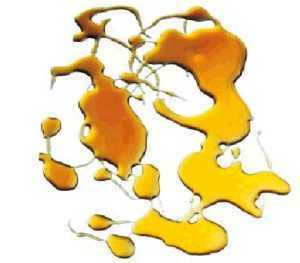 It is usual for some entrained compressor oil to carry over into the compressed-gas stream downstream of the compressor. 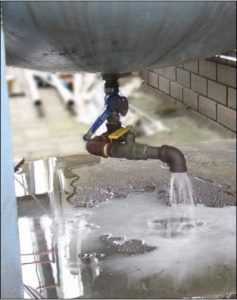 In many applications, this is rectified by air treatment downstream, incorporated with the use of receiver tanks that reduce the local velocity of compressed air, allowing oil to condense and drop out of the air stream to be removed from the compressed-air system by condensate-management equipment. Centrifugal compressors use a rotating disk or impeller in a shaped housing to force the gas to the rim of the impeller, increasing the velocity of the gas. A diffuser (divergent duct) section converts the velocity energy to pressure energy. 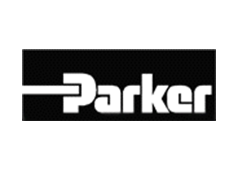 They are primarily used for continuous, stationary service in industries such as oil refineries, chemical and petrochemical plants and natural gas processing plants. Their application can be from 75 kW to hundreds of kW. 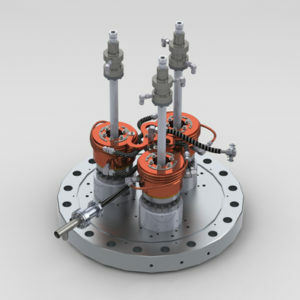 With multiple staging, they can achieve high output pressures greater than 10,000 psi (69 MPa). Used in Gas Turbines, pipeline compression of natural gas, oil refineries, natural gas processing, petrochemical and chemical production, and oil field application. 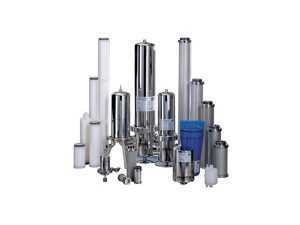 EHL Group delivers a complete system of filtration and separation products for compressed air, gas and liquid systems. 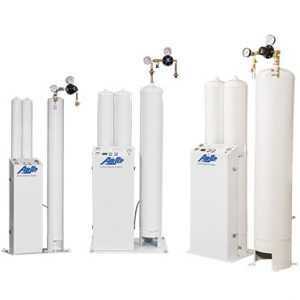 Our technology in the field of compressed air, gas, and fluid separation extends from the compressor room to all points of use in the factory or field. Components are designed and matched for optimal performance, while our engineering and technical service ensure solutions are deployed correctly to ensure specified outcomes no matter what physical and environmental challenges a site may provide. EHL can design and deliver a complete system of filtration and separation products for compressed air systems. EHL’s technology and experience in the field of compressed air treatment, gas filtration, and fluid separation extends from the compressor room to all points of use in your facility. Components and systems are designed and matched to ensure optimal performance. EHL can design and build solutions from concept to reality. 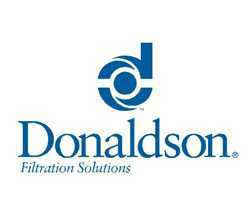 Our partnership with leading global manufacturer and filtration provider, Donaldson Filtration, ensure a global support base for local challenges. EHL’s portfolio covers an extensive range of industrial filters, refrigeration and adsorption dryers, and condensate treatment. Where quality requirements are exceptionally high, EHL has a selection of process filters which will enable you to reach required maximum purity standards. For these purposes EHL supplies an extensive range of pre and sub-micro filters for liquids, for compressed air, gases and sterile air systems. Going green and reducing carbon footprint has been a growing cause for many companies over the last few decades, but over the last five it’s become a business necessity to not only assist in reducing costs and save money, but appeal to a growing population of consumers and clients. Being environmentally conscious is beneficial for all facets of your business from the boardroom to clients, supply chain to production. Many clients and the market are looking for businesses that are “high sustainability”, with people looking for small ways they can contribute to minimizing their environmental impact and also create a healthy lifestyle. If you use cylinders, individual or packs, dewars or get a delivery in a bulk tank, your nitrogen is coming from a large manufacturing plant and delivered to you in large trucks. Conversely compare that to the solutions for localised generation. Which do you think promotes Going Green more? EHL Nitrogen Generation solutions utilizing both modular and twin bed PSA systems for higher purity (98% – <10PPM) and membrane systems (92% – 99%) provide energy efficiency through low air to nitrogen ratios for all purity outputs therefore requiring less compressed air. Not only does it make you self-sufficient, it eliminates the need for large scale gas production plants (source of delivered nitrogen), saves you money and eliminates unnecessary greenhouse gas emissions from the energy these very big plants require and the subsequent delivery vehicles emissions delivering (and returning – in the case of cylinders). The generator itself and any prefiltration only require minimal energy and its main driving factor is just compressed air. Compare that to the gigantic task of compressing gas into a liquid form or cryogenically separating air into its constituent gasses, and then delivering it to your facility where you covert it back into a gas losing some in the process. 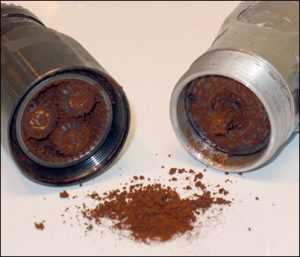 2) It is a more cost effective way of supplying nitrogen. 3) No reliance on outside parties to produce or deliver – in-house utility self-sufficiency! EHL Group in collaboration with our technology partner Fabrum Solutions Ltd bring the new AF Cryo range of gas liquification systems to market. Design parameters have been greatly influenced during development by the key individuality requirements of various critical applications to achieve unique outcomes and downward effects on cost and security of supply with the often remote, regionalised or critical nature of clients applications. Our premise was an overall drive to reduce risk of supply interruption and bring key nitrogen supply provision within the individual facilities. The ability to produce localised liquid and gaseous nitrogen, oxygen, or air brings control back within the sites overview. 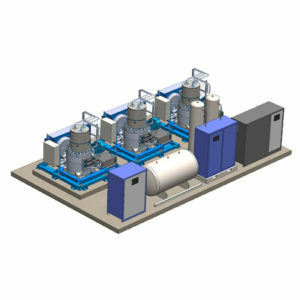 Designed to meet the purity requirements of the key processes, again this can vary by producers / application parameters, the individualised systems combine the ability to supply either or both liquid and gaseous nitrogen, oxygen, or air generated onsite with an additional ability to supply high quality compressed air (ISO8573-1:2010 Class 1.2.1) to any other critical requirements again substantially reducing risk. 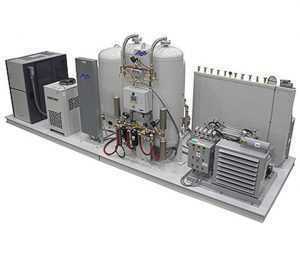 These new systems are capable of also producing combined liquid and gaseous nitrogen, oxygen and air to varying purities for unique applications. The EHL Group / Fabrum Solutions Ltd – AF Cryo – combination of localised production system capabilities render cost effective, low supply risk, and utility. Negate the external reliance on supply, negate the number of deliveries, transport costs, and supply risks, coupled with reduction in the greenhouse gas emissions caused by delivery trucks and consistency in the supply parameters of this utility. EHL’s globally experienced team includes mechanical design engineers, hydraulic engineers, tube & piping fitters, industrial electricians, fitters, industrial designers, welders, trade assistants, workshop technicians, product specialists, sales and marketing staff, accounts and support personnel, and project coordinators. EHL specialists have created solutions for food and beverage customers across Australia, New Zealand, India, UK, and USA leveraging global relationships with key component suppliers to design, build, install, and support specific equipment to meet the application and sites requirements. This market experience and synergies combine with Fabrum Solutions Ltd who produce composite equipment for the cryogenic and superconducting industries, including cryocoolers. Fabrum’s facility and large-scale metal procurement also provides integrated manufacturing for complete systems assembly. 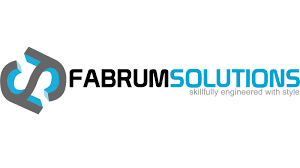 Fabrum Solutions have formed a global joint venture with Absolut Systems, called AFCryo. 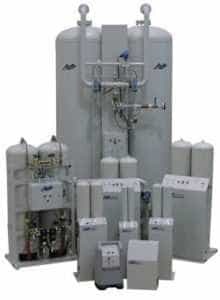 Utilising Absolut’s world leading cryocooler and cryogenic cooling system design capabilities, this joint venture (AFCryo) can deliver global cryogenic solutions across a wide range of industries including wine, LNG, aviation and space, human medical and animal husbandry, and transportation and superconducting. Liquid is generated by cryocoolers that utilise patented diaphragm pressure wave generator technology (DPWG) and linear pulse tubes for condensing and liquefying cryogenic gases. This technology was designed and developed in NZ by Fabrum Solutions Ltd and incorporates cryocoolers utilising a standard electric motor and a simple drive mechanism to ensure service intervals of 50,000 hours between major overhauls. 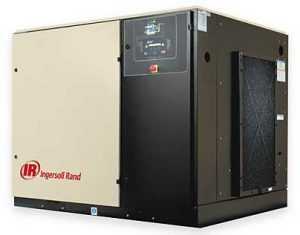 Cryocoolers are 470 watts and 1250 watts cooling output at 77K. These units utilise a high-efficiency linear pulse tube technology. 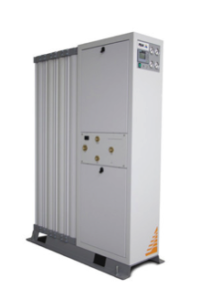 The core technology is the pressure wave generator, which hermetically separates the working space from the pulse tube gas space, ensuring long operating periods between major services, and allows easy access for preventative maintenance without disturbing the clean gas circuit. These units are built in NZ and all IP is retained locally within ANZ. EHL Group and AirSep Corporation offer innovative, non-cryogenic oxygen supply solutions as an alternative to cylinder or liquid supplies. By providing an unlimited supply of oxygen on-location, an AirSep Oxygen Generator eliminates regular oxygen deliveries.For over 30 years, AirSep Oxygen Generators have been a proven alternative to any other oxygen source, reliably producing oxygen, 24/7. 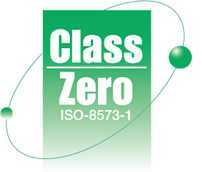 AirSep’s high-quality products are easy to maintain, the most cost effective, and the safest oxygen sources available. 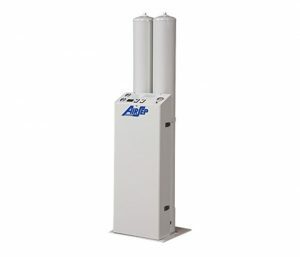 AirSep’s wide range of commercial oxygen generators have secured AirSep as the leader in on-location oxygen generation. 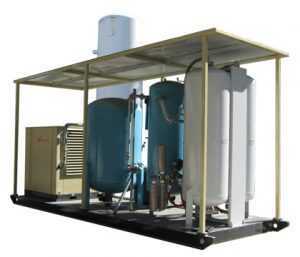 Whether you are in need of a self-contained generator, standard generator, packaged system, cylinder refilling plant, VPSA oxygen plant, or simply have a specific application in mind, AirSep delivers innovative solutions for all of your oxygen generation needs. Used in applications ranging from municipal water treatment to pollution control, hospitals to military installations, fish hatcheries to mining, environmental remediation to ozone generation, AirSep’s oxygen generators provide a reliable source of continuous, gaseous oxygen.